Creating directories have become easier with the availability of technologies like WordPress and other easy web development alternatives. One of the best WordPress themes for creating online directories is the MyListing Directory theme, that lets you create fully functional online directory websites in minutes. 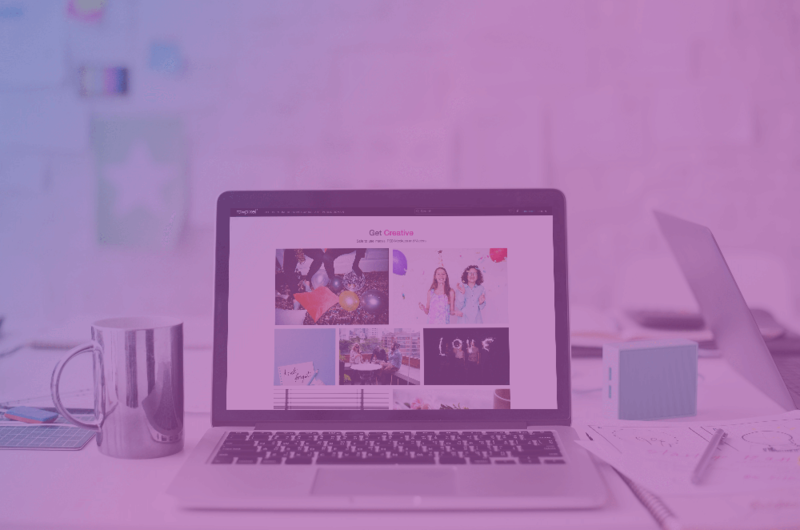 If you are too thinking about creating a commercial online directory with the MyListing WordPress theme, here is an in-depth review and feature evaluation of the theme. What you can do with the MyListing Directory Theme? This is a premium Directory & Listing theme by 27collective, to create a multipurpose online directory. You can use to create a business directory, a real estate directory, a city guide website, or an events portal. It supports custom fields, drag, and drop page builder, eCommerce compatibility with WooCommerce support, map support and monetization features to help you make money through your online directory. MyListing helps you create a beautifully responsive directory website that will work well regardless of the device it is viewed on. Moreover, the theme is SEO friendly to create a directory website that ranks well. What can you do with the MyListing Directory Theme? 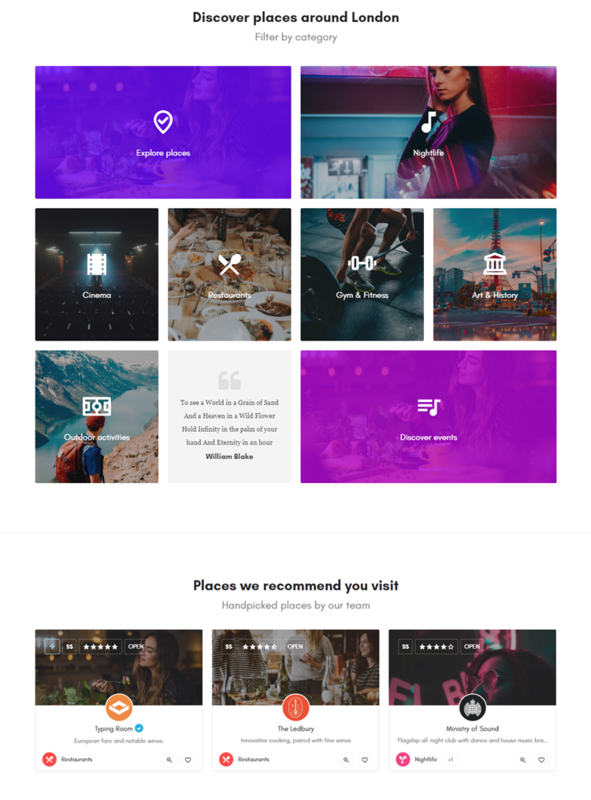 MyListing theme is a multipurpose WordPress theme that can be used to create any kind of directory websites. You can create a commercial directory website with this theme that can help you earn. Since this Directory WordPress theme is highly customizable and supports custom fields and listing types, you can bend it as per your niche. On installing your MyListing WordPress theme, you can set up your WordPress Directory website in minutes. To make your website look exactly like the theme demo, you will have to install the sample data. You can choose from 4 available demo designs. This is a multipurpose design that you can use to create any kind of directory website. This demo has an interactive design which can be easily turned into any kind of directory. It comes with a pre-made section for displaying all the important categories on your website’s homepage, right below the banner area. Besides, there are also snippets of listings for places, real estate, jobs, & cars. Besides, you can easily add or remove the sections into your website. This is a beautiful design with parallax scrolling, filtered search features, smooth scrolling and much more. This is a classic design that you can use for a multipurpose directory or any niche specific directory website. This is a WordPress directory theme that is perfect to start your real estate directory website. It is a unique design with wonderful parallax scrolling sections. It comes with a search bar to help the visitors easily find the locations/estates of their choice. This demo too, has the property category display right below the banner area. This demo is ideal for you to start your property listing portal with front end submission feature. However, you can customize this MyListing theme demo and make it look & work exactly the way you want. Therefore, you can easily customize it for your niche using the directory listing type and custom fields. 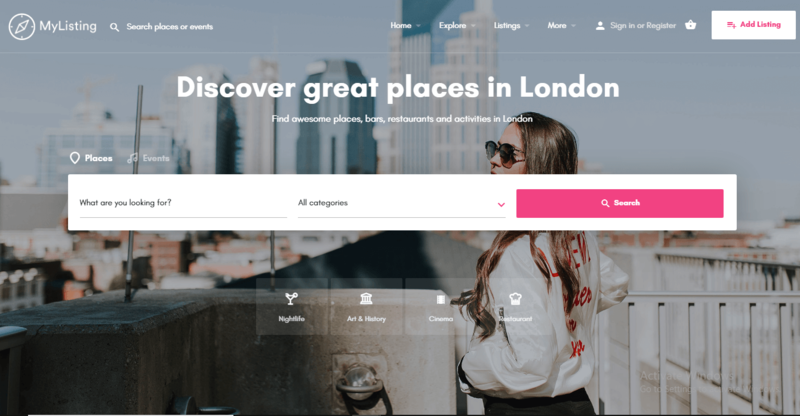 If you want to create a city guide website, this is the demo for you. This demo has a clean and flat design with awesome parallax scrolling. It also has a map section to show you listings on your homepage. It also has an interesting section “explore by city” where you can display different cities with beautiful animation effects. Besides, there are events, advanced search facilities, and much more. You can even use this demo to create a multi-city directory website. This theme demo can be used to create a car rental or an auto directory website. 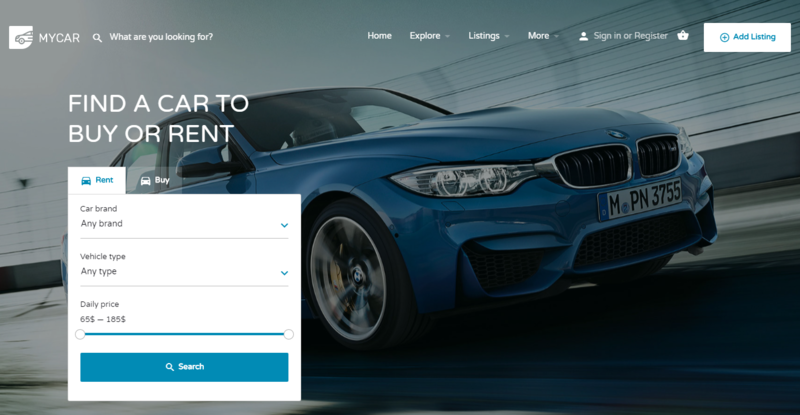 This demo design has beautiful sections to show car types, pricing plans, detailed car listings, and advanced search facilities. The parallax banner, simple yet attractive design, and a clean interface that highlights your listings. MyListing theme is fully customization ready. The requirements of different website owners are different and therefore, this directory theme comes with unlimited customization options. You can use the theme options to change the appearance of your website and enable and disable the features. There are also some customization setting on your dashboard. Besides, the theme allows compatibility with the Elementor Page Builder to create beautiful pages. You can use the page building elements to create professional looking designs just by drag and drop options. Therefore, when it comes to customization and page building, there’s no limit of what you could do with the MyListing theme. 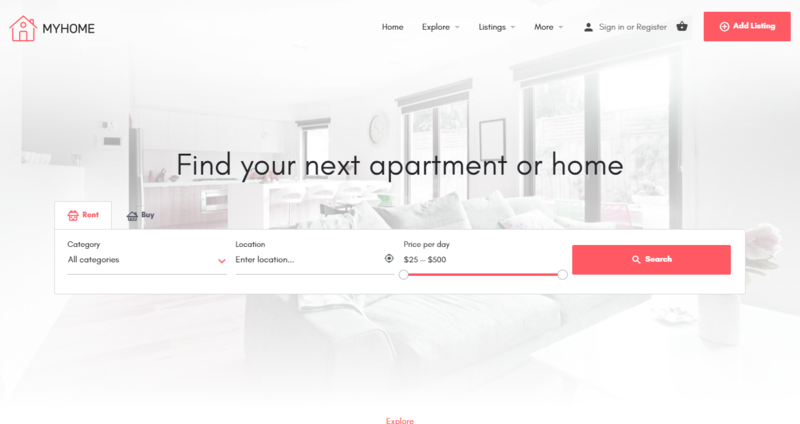 This MyListing theme comes with so many incredible features to create an attractive and feature-packed online directory websites. 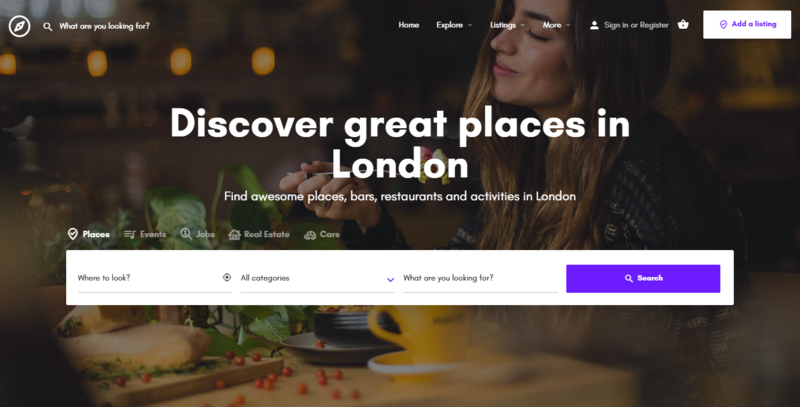 While this theme is loaded with many features, below listed are some of the best features of the MyListing Directory theme that makes it one of the best WordPress directory themes. The MyListing theme is designed with simplicity and care to focus on your listings. The theme has a beautiful parallax scrolling & systematically designed sections. Moreover, the MyListing theme is totally customizable and you can change it to fit your requirements. It is also compatible with the Elementor page builder so that you can use the page building options to create pages of your imaginations. There are many features to help you earn through your directory website. The main being able to display advertising banners as well as allowing paid listing submission. 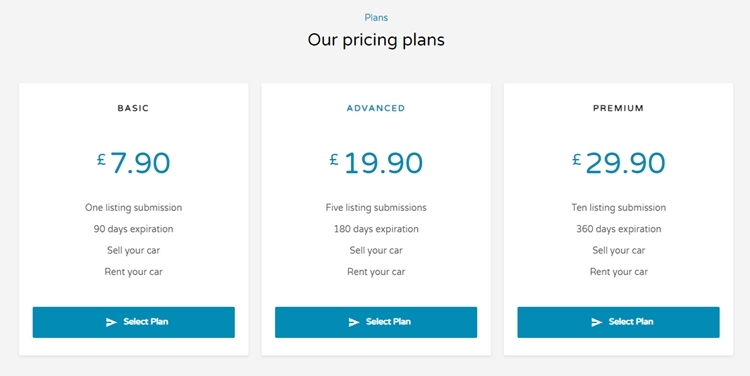 You can create pricing clauses and implement them as pricing packages into your directory website. Your visitors can choose the package of their choice and submit their listing on your website. Moreover, you can even earn through the claim listing feature. Create the type of listings you want with the custom listing type & custom field support. So if you want to create a custom listing type called “churches”, you can easily do so. For the listing type church, you can create unlimited custom fields. This makes it possible for you to use your WordPress directory theme for any purpose of your choice. Moreover, you can create and use the listing type and custom fields without any technical expertise. You can even edit the existing fields as and when you need. Maps are very important for directories and MyListing theme comes with integrated maps. 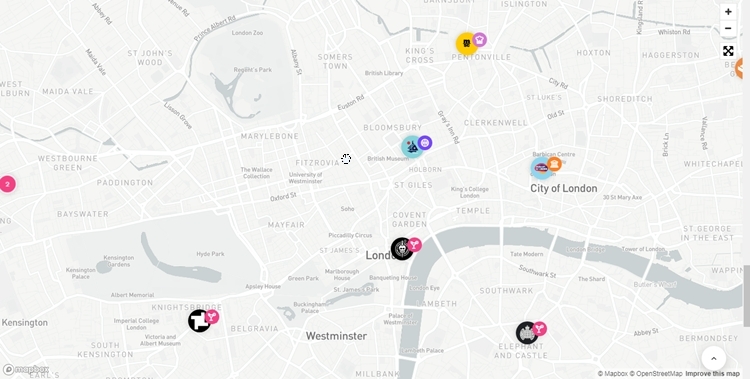 For the maps on your website, you can use the custom map markers, to make the maps and your listings more interesting. It also supports Custom Google maps location previews. For the already added listings on your WordPress website, you can allow your visitors to claim the business listings. If the claim is granted, they have the full ownership for the listing and can edit it and have additional information appended as per their requirement. The claim listing feature is one of the important money making features of the ListingPro theme. It helps you use your existing listings to earn through your website. The advanced search options are generally present in the banner area. So your visitors can directly indulge in the listings of their choice. Importing the demo data will automatically create this search filters for you but you can easily edit them. Moreover, you can place the instant search widget that you can use at different places on your website. The MyListing theme comes with WooCommerce support to let you create eCommerce shop along with the directory website. There can be other applications of WooCommerce. You can use it to sell event tickets, etc. In short, any kind of eCommerce facility, to accept payments through your website. This listing directory theme can be used to create a review website through WordPress. Besides, there are review and rating features for every listing. Social login is one of the most desirable features of an eCommerce website. It allows your visitor to easily log in to your website. 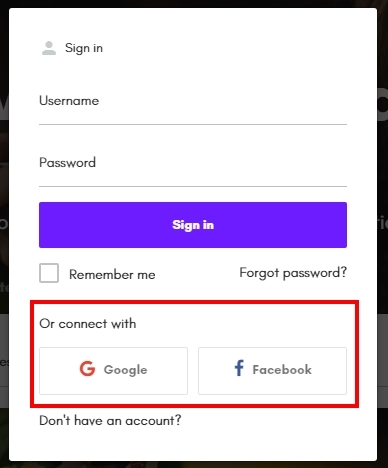 With this inbuilt feature in your WordPress directory website, you can allow your users to log in through their social media accounts like Facebook or Gmail. This puts them to ease and eliminates the requirement of a remebering the username and password to get access to your website. MyListing WordPress theme comes with documentation with more than 200 articles on different subjects. This knowledge base can help you find answers and to understand the functionalities of your theme. Therefore, as far as documentation and support are considered, MyListing theme’s help channels are well up to the mark. The MyListing theme is one of the top selling WordPress themes on the ThemeForest marketplace. This product is available for download at a nominal price of $59 and is available to download from the ThemeForest. It is quality checked by the Envato studio and comes with free future updates, whenever they are released. At $59, you get 6 months of free technical support. If you want additional support, you can pay an additional $18 and get support extended up to 12 months. There are many listings WordPress theme for you to choose from. You can choose a directory theme for your website as per your requirements. MyListing has all the features that you will need for an online directory website. Moreover, it has a modern and clean design and the demo options that makes it possible for you to create professional looking online directories without touching a line of code. Also, this theme is one of the most affordable directory templates. So if that is what you are looking for, look no further. Alternately, you should have a look at our Directory WordPress theme and our directory child themes for creating multipurpose or niche directory website. The feature-packed directory theme is ideal to start an online commercial directory that is flexible and manageable.